Instantly we were back in the land of newborn babies.The last days of February had us away from the shop and busy in the barn. Two baby goats were born! We named the kid above Rose, and the male started off named Stinky, which has since progressed to Apollo and Rocket. He has more names now than days old. (The plan if three kids were born was to name in respect to the Apollo 13 mission: Jim/Lovell, Fred/Freddie, and Jack/Jackie.) Aside from dreaming up names, we were busy keeping watch over cold bodies and imperfect nursing mothers. But a few days later, we're enjoying jumping, bouncing baby goats! In the shop, Matt has been experimenting with the glueless, screwless casket construction techniques. Currently the base wood is pine, soon to add walnut. The panels as well as the box itself will all be put together with sliding dovetails and wooden pegs. The pegs in the pine casket are made of ash for strength. 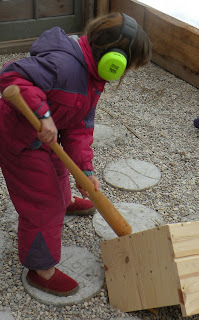 And the strength is partially put to test by our R&D/Quality Control Department...5 year old with a baseball bat. The peg system is a no brainer goal for us; "green" by default. We believe very strongly in the value of simple construction and materials, and have heard so many others with the same thoughts in regards to caskets. Constant insurance that what we are doing make sense on so many levels. Give us a call at (231) 537-2196 or email us at nelnamar@gmail.com to order or for more information.